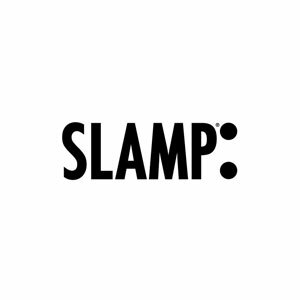 SLAMP was set up, in 1994, by Roberto Ziliani (CEO Slamp), to create something new in the Italian design arena: a business that could offer high quality lamps, where an artisan's eye to detail would meet the excellence of industrial production. Products made with patented and innovative materials, that were going to be unique and immediately recognisable. Thus, after gathering around him some of the greatest international designers, such as Mendini, Cibic, Dalisi, Garro, Munari, the "Slamp Tube" was born in its many graphical versions. Since then SLAMP's growth has never stopped, so much today it is one of the most representative brand-names in the field of decorative designer lighting; an actual point of reference for anyone wishing to possess a much sought-after, original, exclusive object, yet within everyone's reach. The success of SLAMP is all in its DNA, which consists of curiosity for new materials and experimentation and trust in one's instinct but always through futuristic engineering solutions. A perfect marriage between inspiration from the great masters and visionary force, great passion and undeniable skills, that guide the young designers of the Slamp Creative Team beyond the limits of the already seen. Slamp devotes itself to decorative design lamps, capturing the most current trends, drawing on the natural world, on architectonic, sartorial virtuosity and on artistic developments, transforming them into luminous objects, which are both suggestive and versatile. Every Slamp lamp is unique and recognizable thanks to the use of patented technopolymers which are light, noble and unbreakable, allowing one to create and construct forms, decorations and effects otherwise impossible with other materials. As in any haute couture atelier, the creation of a Slamp lamp follows a precise "ritual" of transformation, through a system of cold cutting, slots and folds executed by hand: a flat sheet of technopolymer becomes three dimensional volume.